Anywho – on to the Five! One. 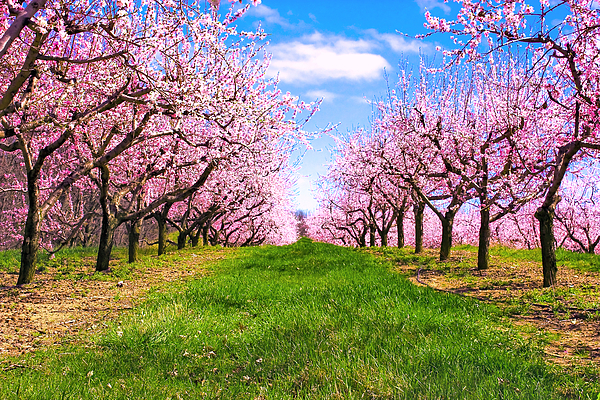 Apple Blossom Festival – The most glorious reason why I am off today! Every year, Winchester holds it’s annual Apple Blossom Festival at the end of April/start of May and it’s kind of a big deal because around here, apples are a big deal! The Festival has been an annual thing since 1924…so, it’s basically been around forever! It’s evolved from a one day thing to a week long festival with dances, parades, carnivals, luncheons, crafts, a 10-K and plenty of “celebrities” added into the mix. I don’t know how much I’ll participate this year since it’s supposed to rain almost all weekend – boo – but it’s usually lots of fun and involves everyone wearing plenty of pink and green! I’m sure you get the whole pink & green thing now…right? Two. Pedicures – Absolutely one of the best things in the world is a good pedicure, right? So relaxing and wonderful! This week was Administrative Professionals Week and my boss spoiled our office in a big way. He took us all to lunch and also bought us chocolate…and then just to go above and beyond, he sent us all to get pedicures – during the work day! I went with a theme near and dear to my heart and I think it turned out quite nice! Three. 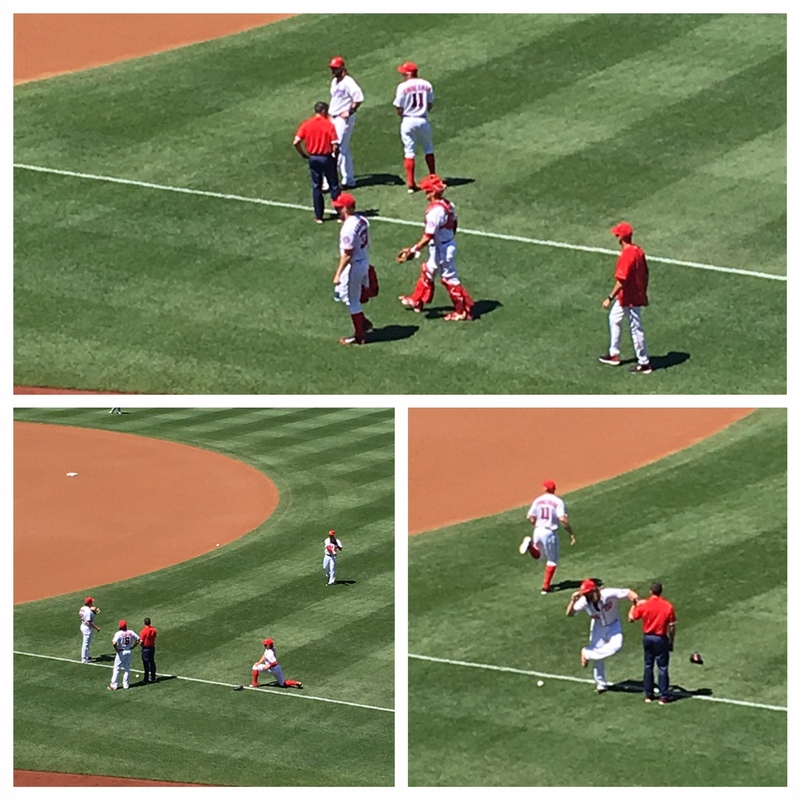 Nationals Baseball this Week – This week has been a little less stellar than the past two weeks, but I have to remind myself that baseball is a marathon…not a sprint. The Nationals are 4-2 for the past week, so that’s nothing to be too sad about but it is troubling that those losses came at the hands of the Phillies…who are supposed to be pretty crummy this year. Oh well. 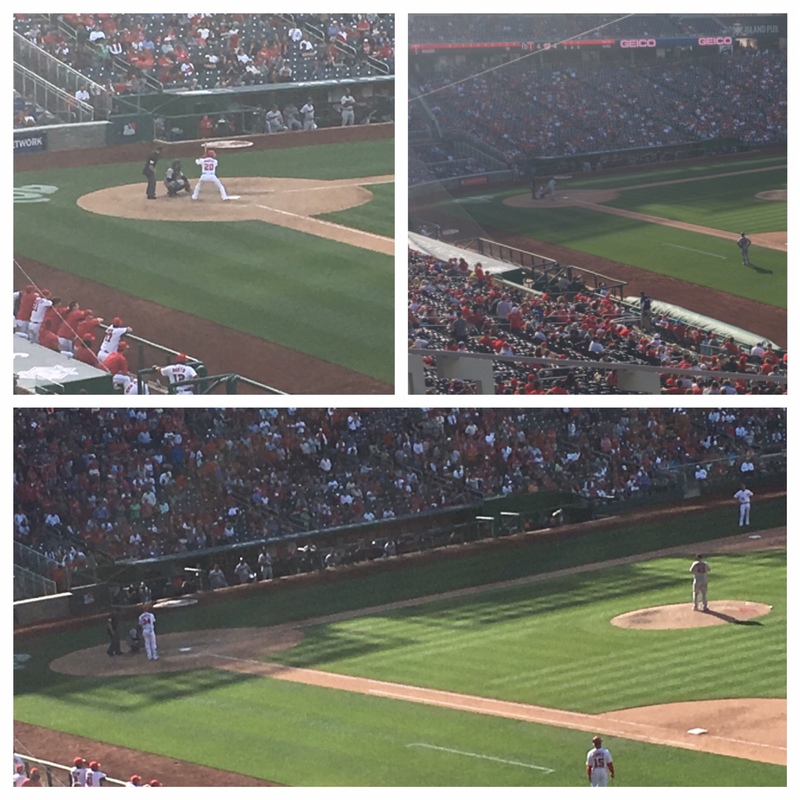 The game of the week was hands down Sunday afternoon (and night) when the Nationals defeated the Twins after sixteen innings; courtesy of a walk-off home run from Chris Heisey. The game would have been the game of the week without a doubt…but it was easily my choice because I was there! 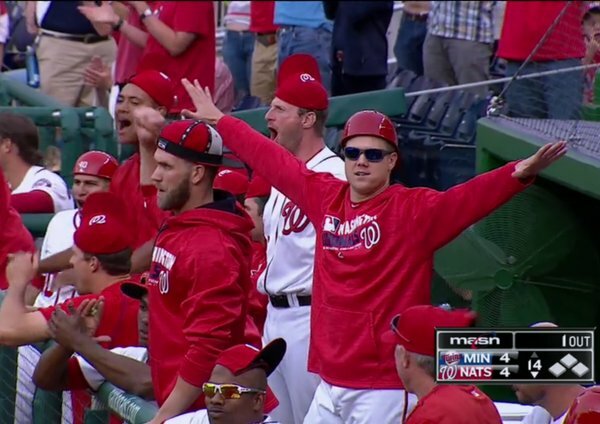 It was and will always be one of the most memorable games in Nationals history…and it’s also the longest regular season game in Nationals history. Not bad. Poor Dan Kolko…not even prepared…ha-ha! Four. Hockey – Which I’ll go ahead and confess I know nothing about, but I’ve been paying close attention to since the Capitals are in the Stanley Cup Play-offs. My friend Katie and I discussed hockey last week while we were at the Nationals game; they were posting the score of the play-off game in between innings and the crown went wild when the final score was posted and everyone saw that the Caps had moved on to round two! Katie knows all about hockey…I know all about baseball…I’ve won Katie over on baseball, now maybe next season we’ll catch a hockey game? 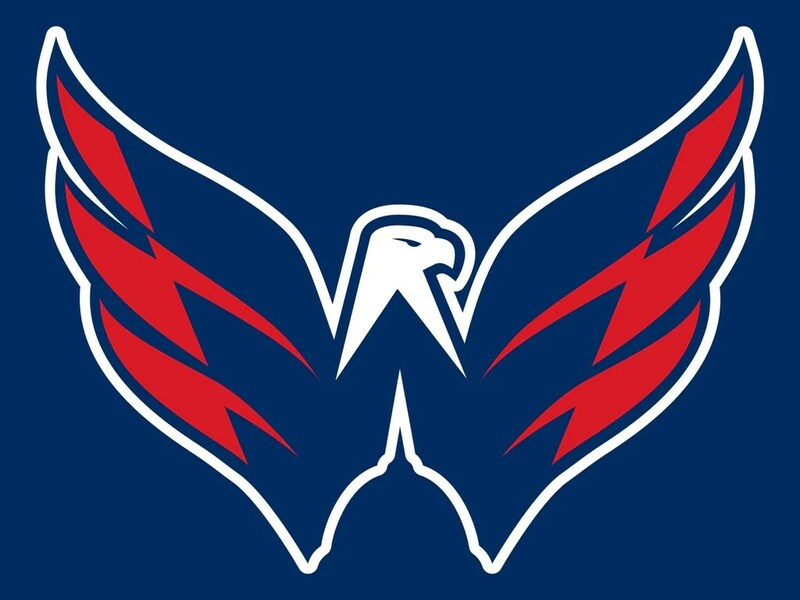 Who knows – but hey…Go Caps! Rock the Red – Sort of…. Five. 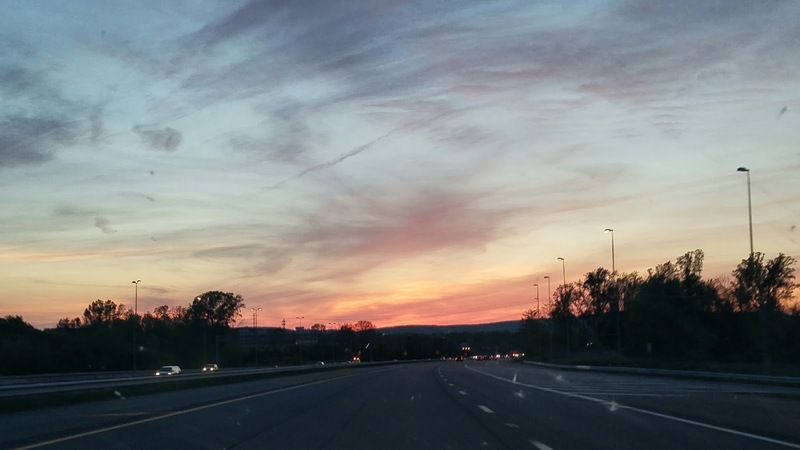 Fitness – This week has been good; I’ve really felt like I’m hitting my stride with the exercise and while the eating hit a bump or two ( I mean – it was Administrative Professionals Day and how can you say no to chocolate??) I still feel like I’m doing pretty well. I guess as long as I keep on keeping on, that will be what makes the difference, right? I do know that I am consistently losing weight, even if it’s only a pound or two a week – a pound or two a week is better than nothing. And that’s all I’ve got for this Friday – so until the next post, I hope you have a good weekend! I’ve been in the kitchen – which can be both exciting and scary! Okay…I’m being dramatic…there really isn’t anything too scary about it; I wasn’t in the kitchen to create anything too out there, nothing like the time I tried to make pickle chicken. Ha-ha! Yes – that was a thing – I read rave reviews about people putting chicken in pickle juice and it being delicious. It wasn’t terrible…but yea…I haven’t made it again. I love both pickles and chicken. Just not together. Gag. These two thing though; they are not gross. They will not make you gag…they will actually probably make you smile with delight at how delicious they are. There are no pickles involved in either recipe but there is lovely broccoli and cheese and chocolate and whipped cream…and no, not together. Ha! 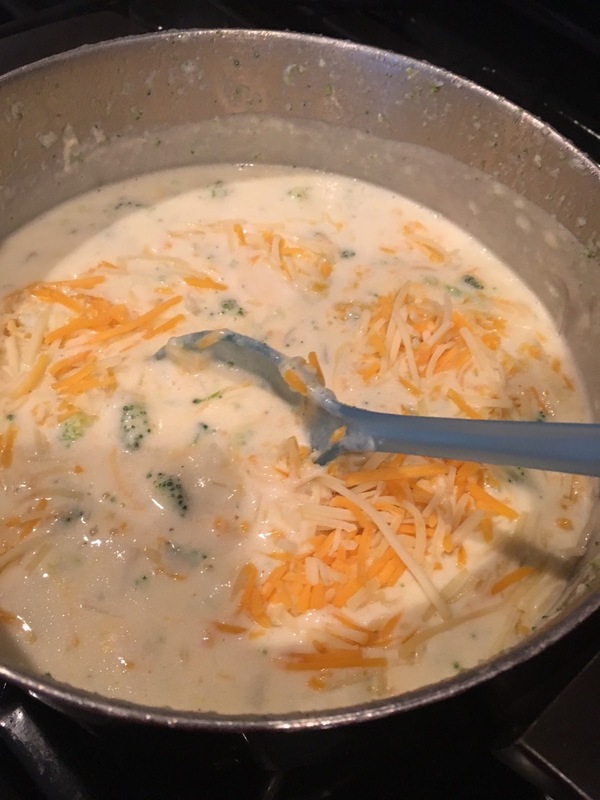 I peruse the Pioneer Woman website on the regular and she has not one but two recipes for Broccoli Cheese Soup. 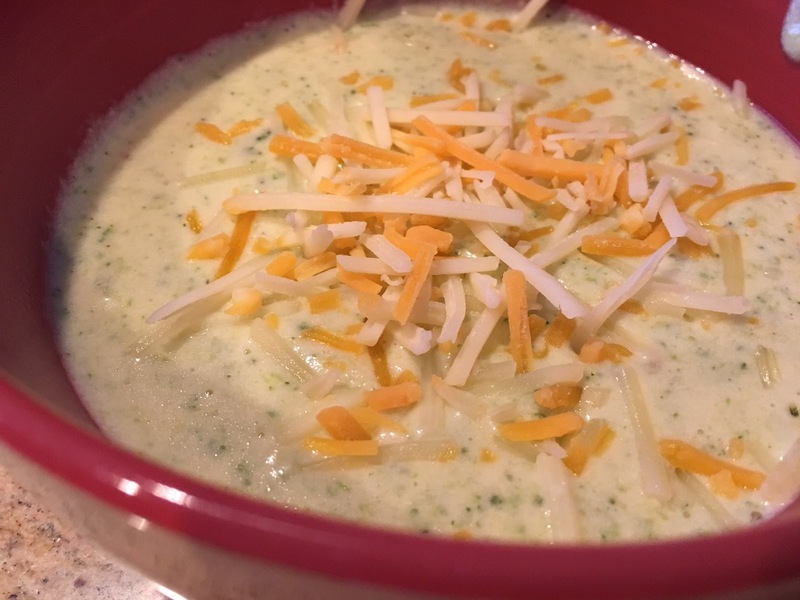 A few months back I took a chance on getting Broccoli Cheese soup from Panera and fell in love; I’ve been looking for a recipe ever since and the Pioneer Woman seemed like a definite excellent choice. I decided to do the stove version – mostly because I didn’t think ahead enough to do the crock pot option – and it was delicious. I didn’t expect it to be anything less than splendid though! 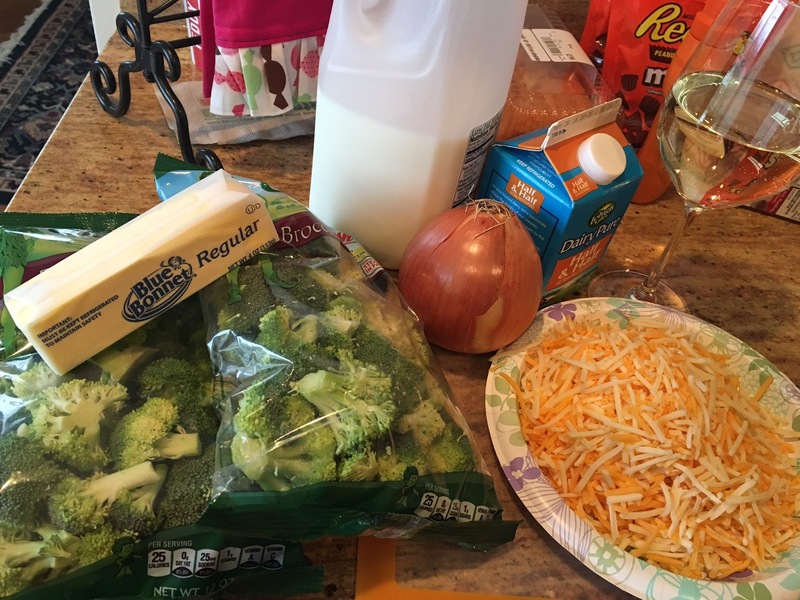 Ingredients – minus the glass of wine. That’s for the chef to drink while cooking. Buttery onions smell absolutely amazing. Trust me. 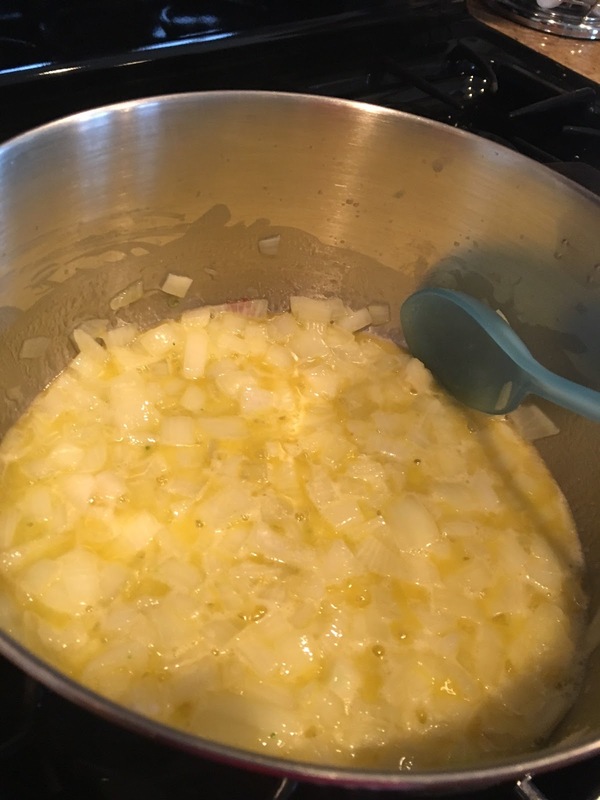 – Melt butter, add onions. Cook for 3-4 minutes and sprinkle in flour. Stir to combine and cook for 1 minute. 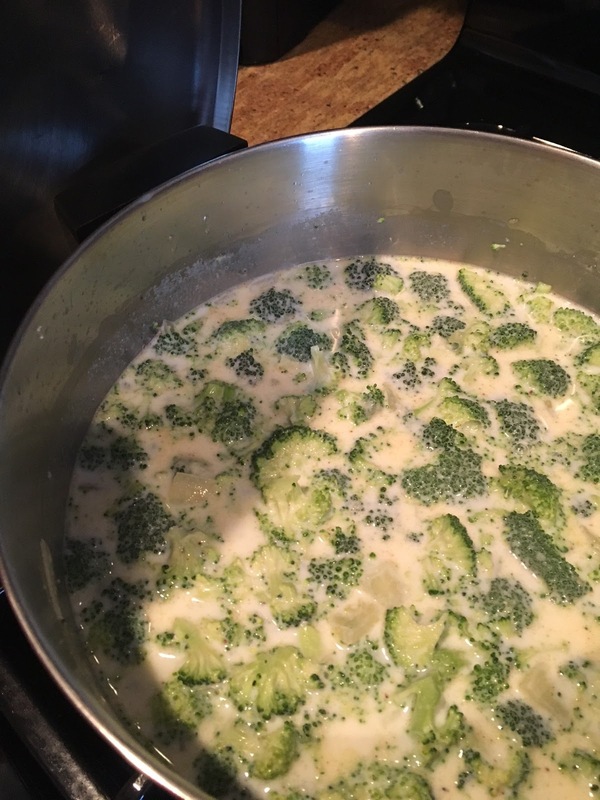 – Add in milk, half & half, nutmeg, salt, pepper and broccoli. Cover and reduce heat to low (seriously, reduce the heat or else you’ll risk overflow – eek!) Simmer for 25 minutes. – Stir in cheese and allow to melt/combine. Puree as much of the soup as you’d like – if you want a cream style soup, puree it all. If you prefer larger pieces of broccoli then don’t puree it at all. I did about half of mine and loved it! – Add in chicken broth if you feel the soup needs to be thinned. I didn’t actually use any chicken broth; I liked the creamy consistency that my soup was at! The second kitchen creation I made this week was a dessert for dinner with some friends. I wanted something that would look and taste delicious/fancy/make it seem like I slaved in the kitchen…but I didn’t actually want to slave in the kitchen, ha-ha! 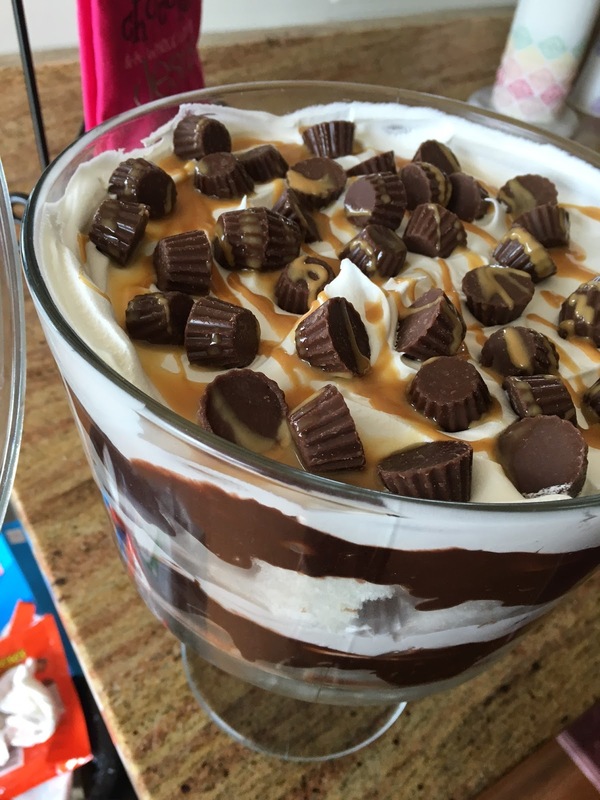 My Mom mentioned that a trifle is always a good choice and I investigated some recipes online before happening upon a peanut butter cup trifle that seemed like the perfect choice – when are chocolate and peanut butter not the perfect choice?? I tweaked the recipe just a bit to my liking and it was a big hit with my friends. Also – it was crazy easy! So, go ahead and make yourself one too! – Make the pudding according to the directions on the box; put in fridge to set while gathering your other ingredients. 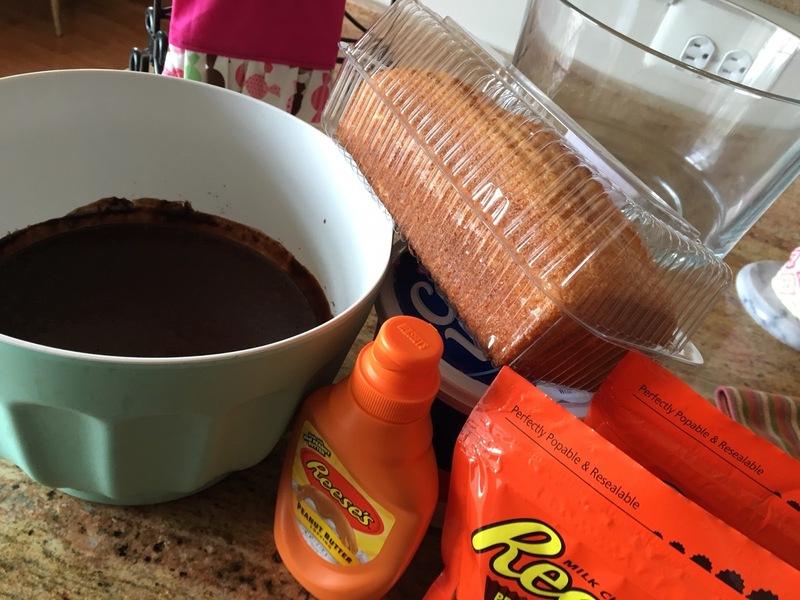 – Cut the angel food cake in cubes and begin layering: cake cubes, chocolate pudding, Cool Whip, Reese’s minis and a drizzle of peanut butter ice cream sauce. Repeat as preferred. I’m not kidding when I tell you that is probably the easiest dessert I’ve ever made and it looks SO much harder than it actually is! It also tastes absolutely delicious. 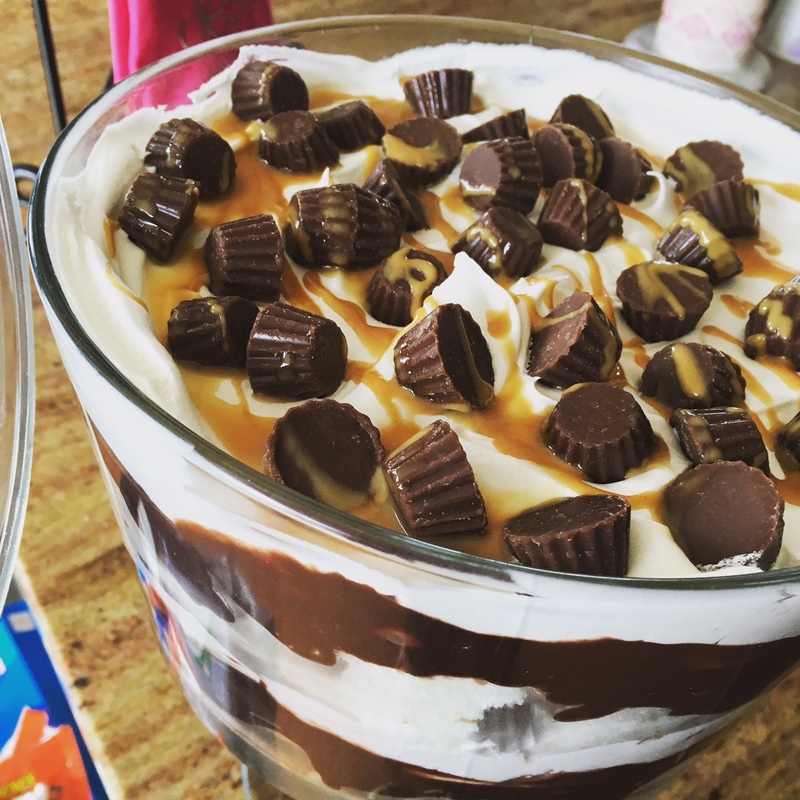 I promise – make this dessert and you will not be disappointed! That’s all I’ve got for now – go to the grocery store, buy some delicious things and get cooking! 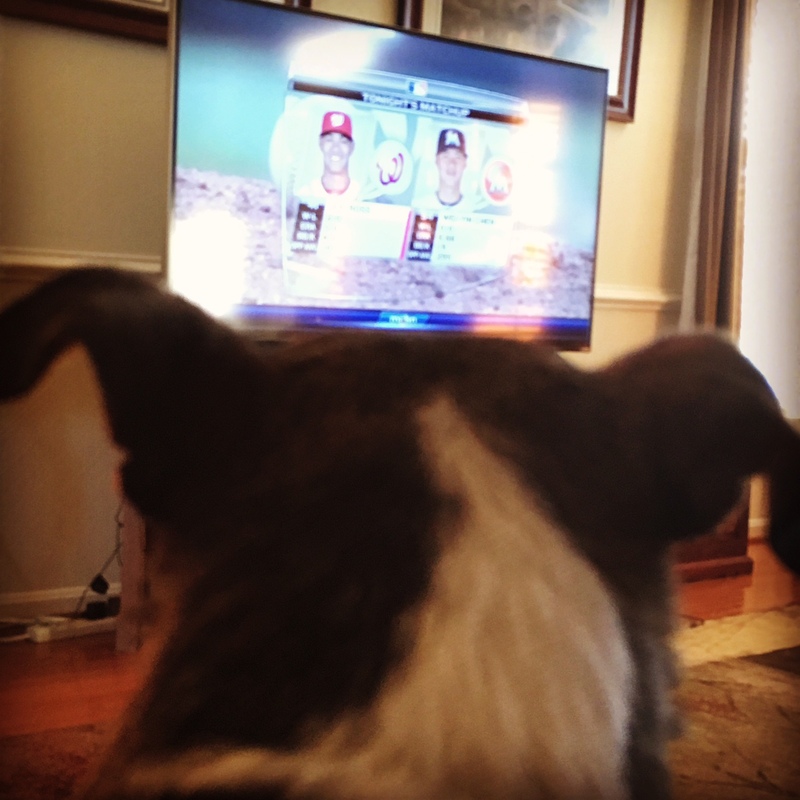 A Post That Largely Features the Dog…and Some Baseball…. Looking back on this jam-packed week! Monday I had myself something of a little adventure while I was out getting in my two miles (or more)… The weather is turning nicer and so of course, some little (and not so little) creatures are venturing from wherever they’ve been hiding all Winter and I had an encounter on Monday. As I was cruising along, I noticed up ahead what appeared to be a very long tree branch laid across the road…and yes…I know you’re wondering how I confused a tree branch and a black snake. I blame my lack of focus – I was fiddling with my iPhone and the music on it. The closer I got to the “stick” in the road, the stranger it looked. And right about the time I pulled up even with the “stick”, I realized the end closest to me had beady little eyes and it was definitely not a stick but a snake. I immediately jumped sideways out of it’s path and when my feet hit the ground…I wasn’t just jogging, I was full on running. Once I acheived what I thought was a safe distance from the snake, I looked back…and it was still just relaxing in the middle of the road. 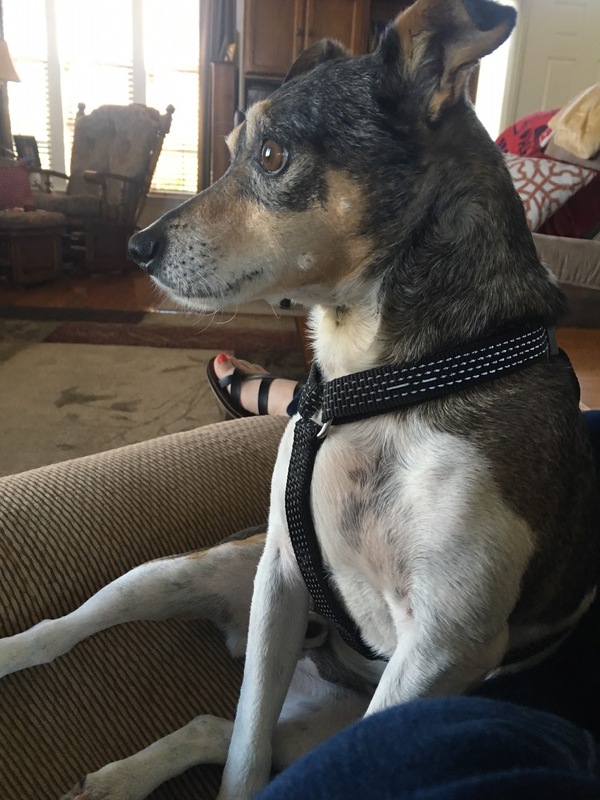 I had Watson with me and somehow he completely missed the snake – I think that in and of itself was a miracle. But yea – I can run faster than I thought – with the right motivation! 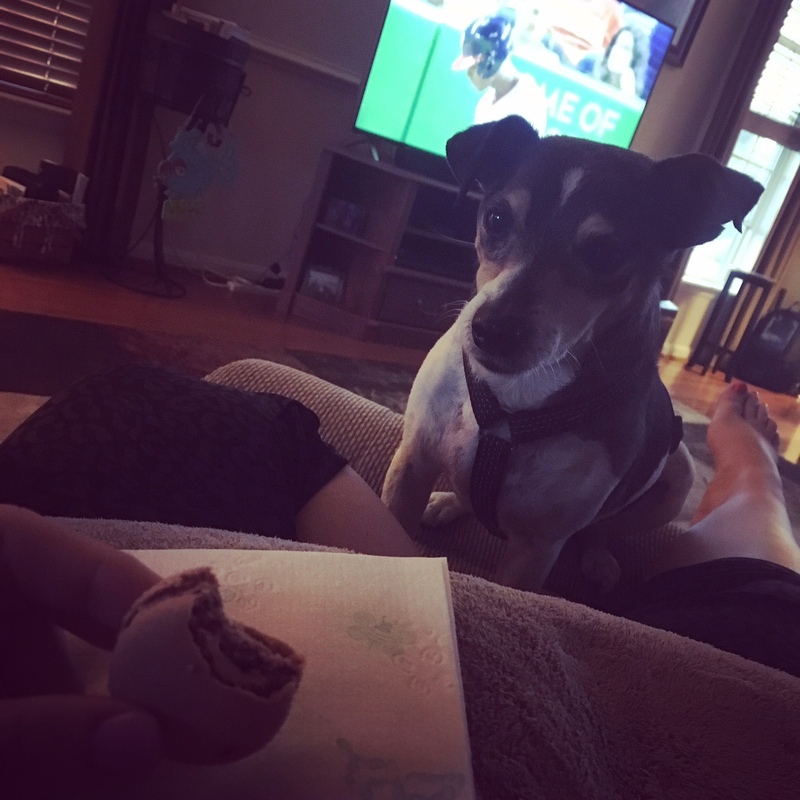 So – we survived the snake – can you share your macaroon please? 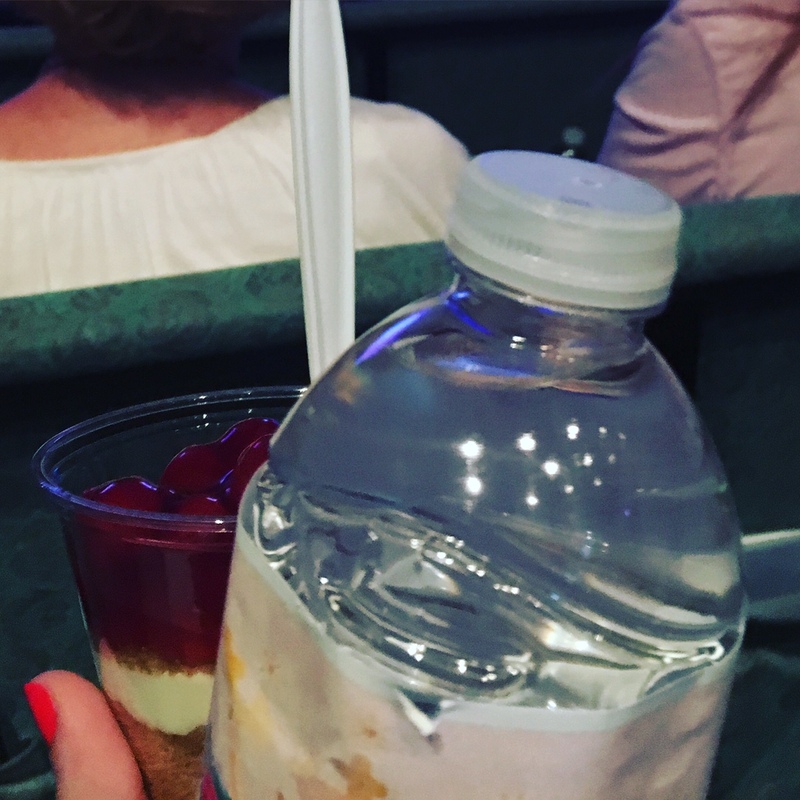 Cheesecake & bottled water on Tuesday night – no problem! Tuesday night I branched out and went to my church’s ladies group – called Lavish Sisterhood. Now, apparently some people would never know this but I tend to be shy and don’t necessarily love social situations if they require me to go on my own. However, so far the people at my church have been so welcoming and so I reached out, made myself a “friend” and headed over to the church on Tuesday evening. They had bottled water and cheesecake…and of course, some Starbursts waiting on each lady in her seat, along with the sentiment: Don’t let anyone treat you like a yellow Starburst when you’re clearly a pink Starburst! Ha-ha! The evening went a little longer than I thought it would, but I had a good time – the group won’t meet again until September – but I think I’ll go again in the Fall! 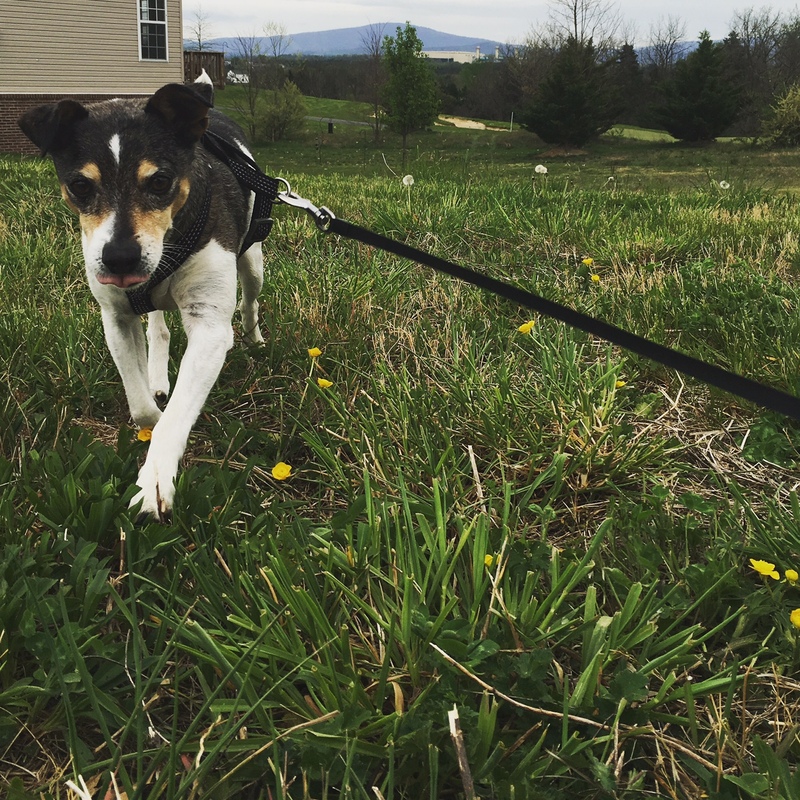 The rest of the week itself was pretty uneventful – I walked and walked, ha-ha! 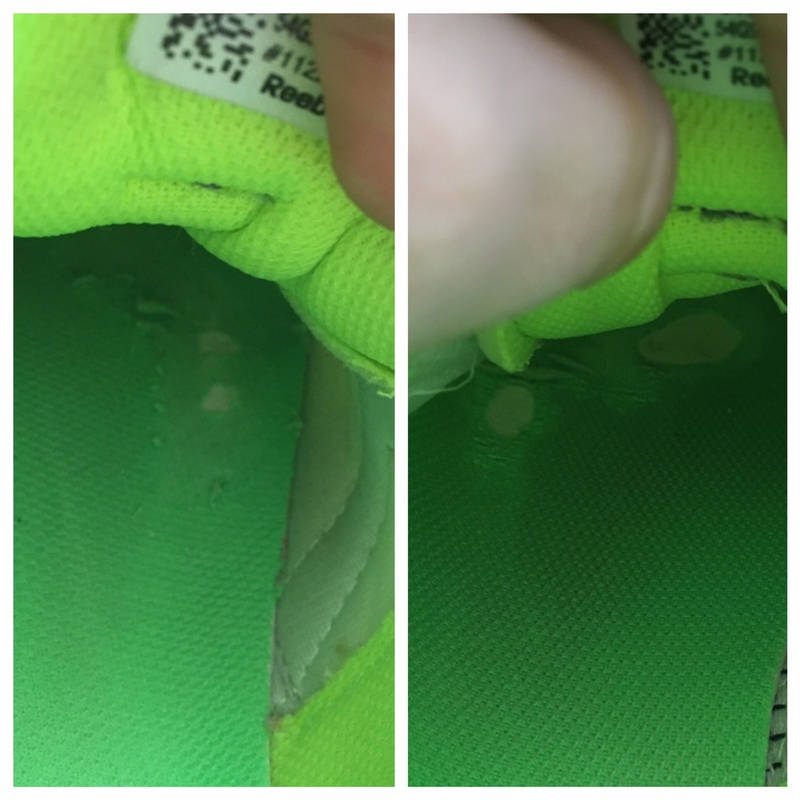 I also realized I must be doing something right because not only are the soles of my sneakers starting to show some serious wear, the inside of my shoes are looking pretty rough too! I guess I need to be on the lookout for some new shoes. I watched lots of baseball – which will be par for the course for the next six months – and beyond that, it was just the usual: work, walk, eat, sleep & repeat. Ha-ha! 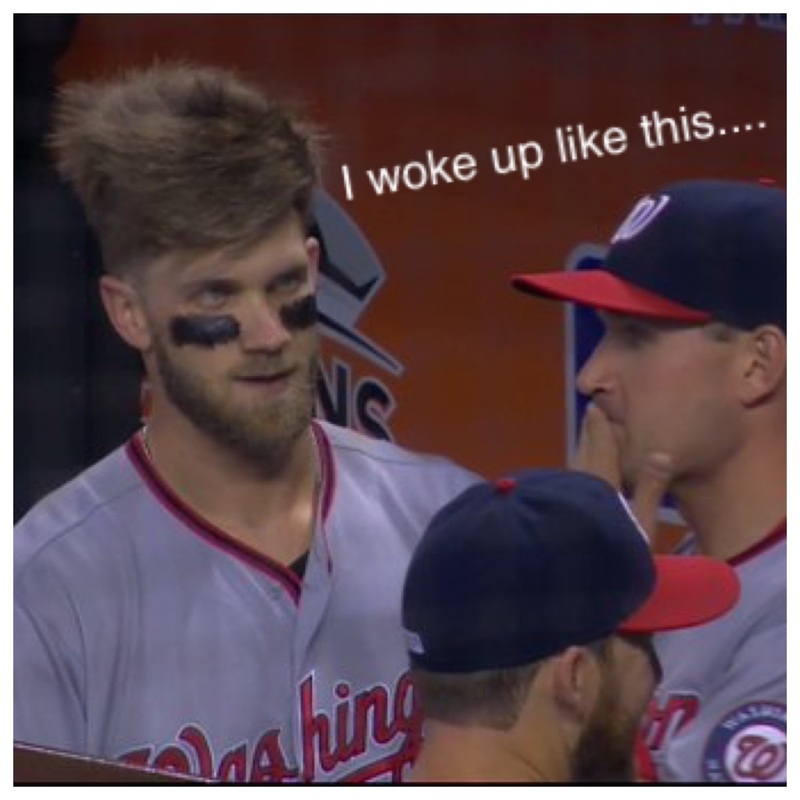 When you have all the hair…ha-ha! W – he’s such a goofball…. 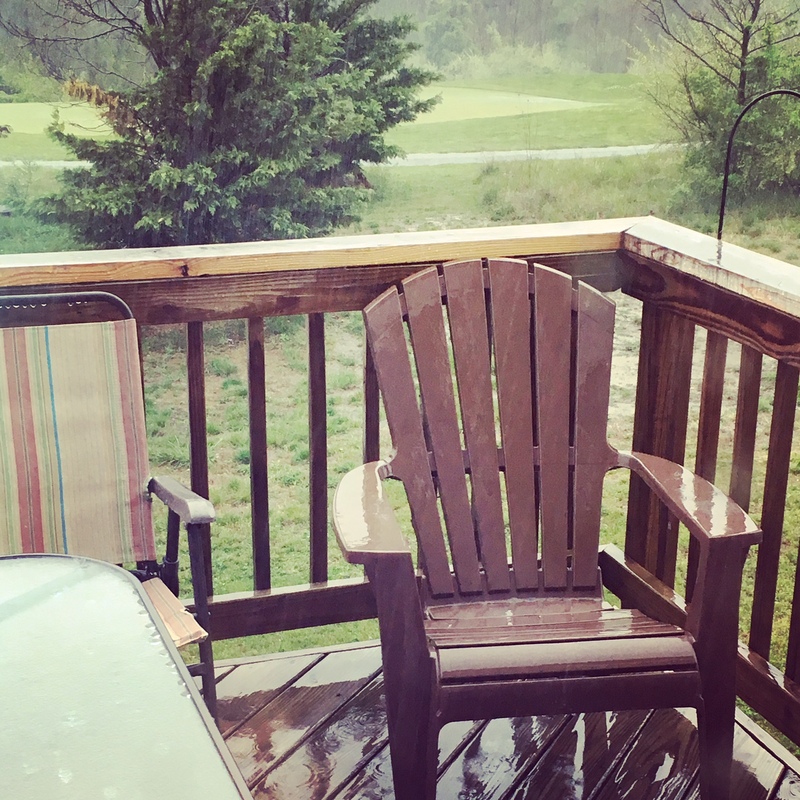 Friday afternoon we were granted release from the office a bit earlier than usual and while I’d intended to do all kinds of things on Friday evening…and figured I could do that much more with the extra time…I came home and just did nothing! I thought about walking a couple miles…but I didn’t. I thought about reading a bit of a book…but I didn’t. I thought about doing a lot of things but I ended up watching a couple episodes of The Office while I did some laundry and then I made Broccoli Cheese soup (courtesy of the Pioneer Woman) and watched the Nationals game. Once that was over, I watched a bit more of The Office before crashing for the evening – it wasn’t an exciting Friday night, but it was oh so enjoyable to be lazy! I woke up earlier than I planned on Saturday, courtesy of a huge thunderclap that was amplified by my open bedroom windows. After trying and failing to go back to sleep, I went downstairs, got a cup of coffee and started the movie Crimson Peak – a creepy Gothic romance/thriller that went perfectly with the dreary weather. 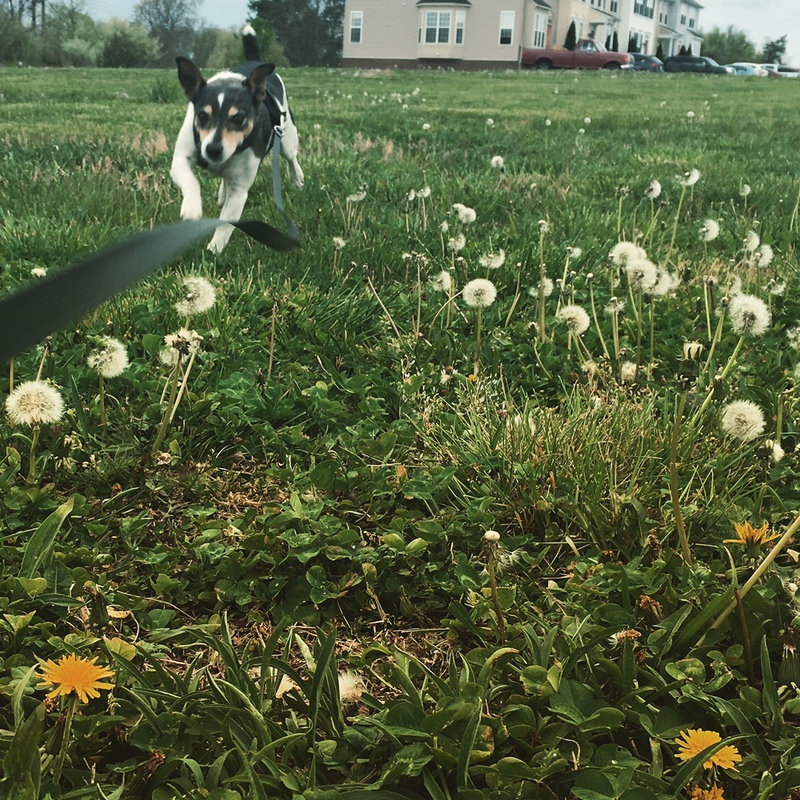 The rain cleared off a little later in the day and so Watson and I enjoyed a couple walks outside in the sunshine and cool breezes, I watched Outlander and of course…the Nationals game…all before making dessert and heading to my friend Danielle’s for dinner. We had such a good time; the ladies did a little shopping before we all ate some seriously delicious food and then just sat around and chatted. I had planned to finish the fourth season of The Office once I got home, but yet again – I was so tired that I was fast asleep before 11:00! Bum alert! 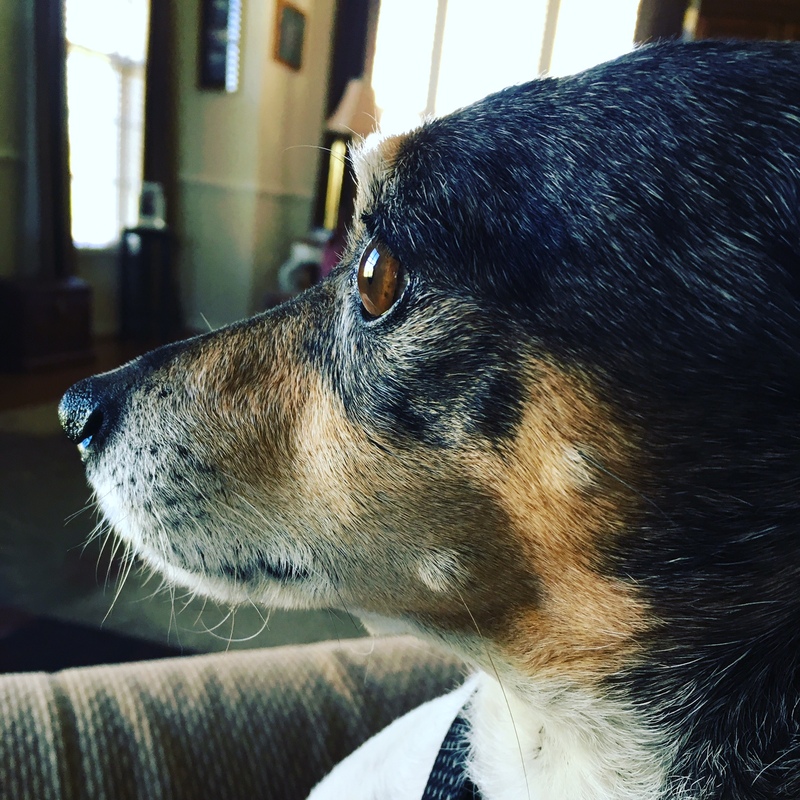 Sunday morning = deep thoughts. Nationals baseball = the BEST baseball. Sunday I woke up earlier than expected (again) and since I had some time to kill, I watched The Night Manager while I had my coffee. I chatted with my little sister the whole time I got ready and at 9:30 my friend Katie arrived at the house and we headed for DC…well, we headed for Vienna and the Metro to get into downtown DC. So much easier than dealing with traffic! 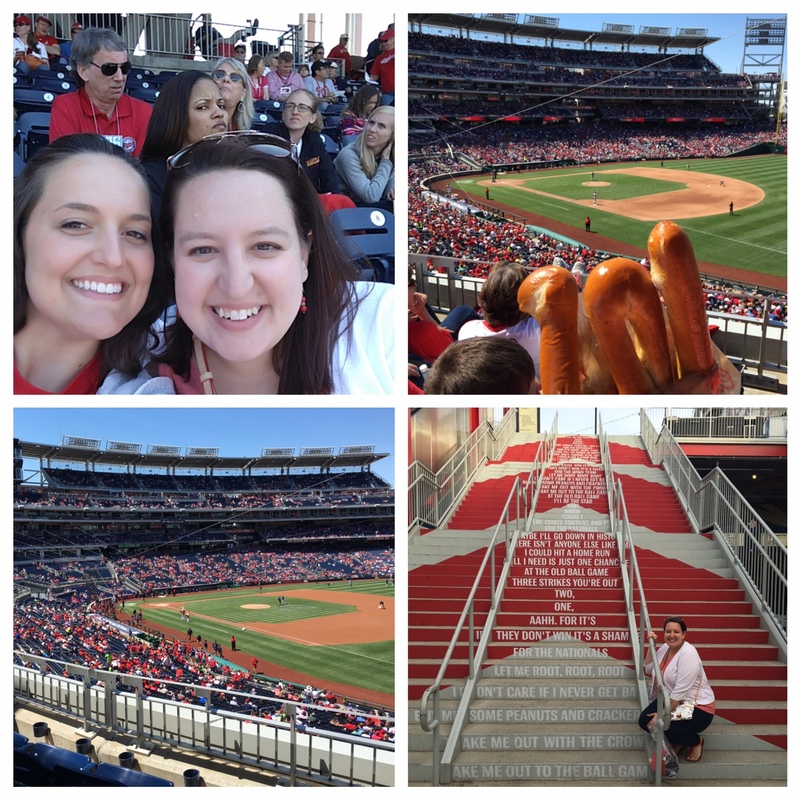 I finally…finally got back to Nationals Park and was so happy to finally be getting ready to watch a Nationals game again! The weather was absolutely perfect and the game was hands down one of the most amazing I’ve been to! 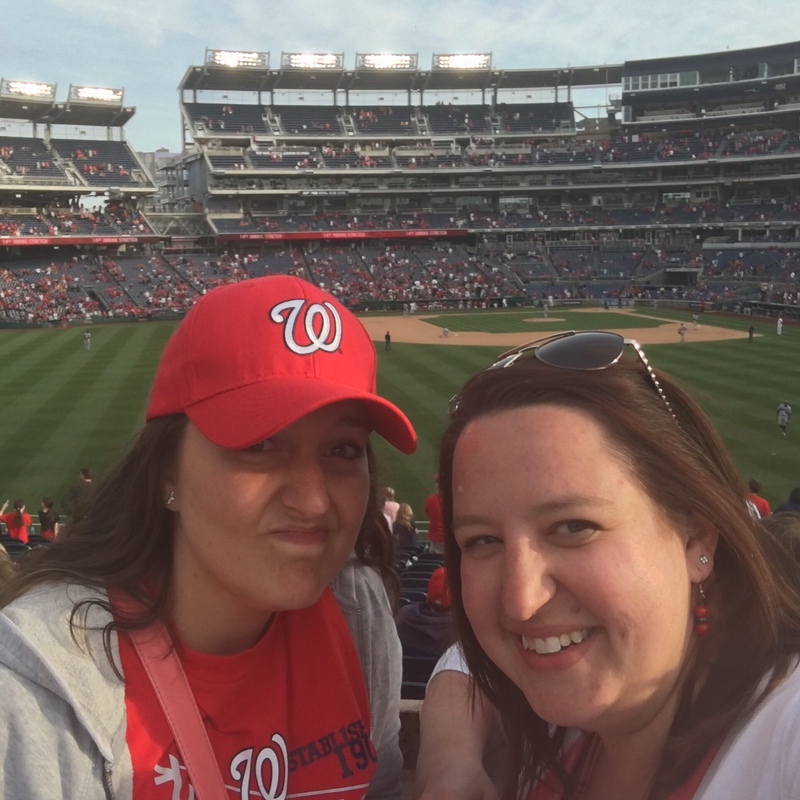 Of course, I’ll be devoting an entire post to the historic game but I will share that I think I might have won my friend Katie over to the joys of being a Washington Nationals fan. That’s always a huge plus! 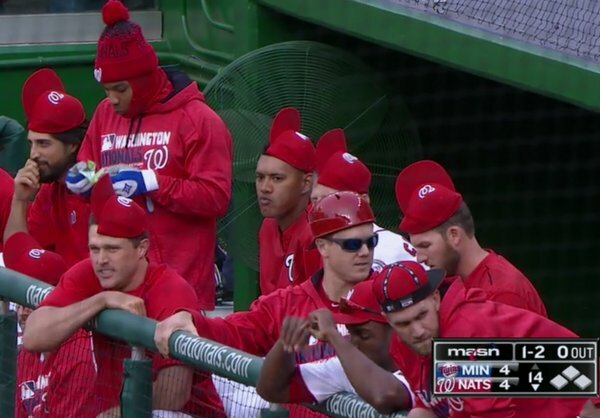 Wearing their “rally caps” in the dugout…ha-ha! The Nationals won the game in the 16th inning – after 5 hours and 56 minutes of play – such a rewarding feeling to be on the winning end of such a crazy and amazing game! We got back home a lot later than I thought we would but I had just enough time to change into comfy clothes and warm up a bowl of soup before the sixth season of Game of Thrones started. And just like that…another week and weekend were over and done with, nothing left of them but happy, happy memories! Friday has arrived once more – as always – I am so glad to see the weekend! Or at least…it’s almost the weekend, ha-ha! Here are five things that are floating around in my head on this rather gloomy (at least in Northern VA) Friday afternoon. One. Flashbacks – Y’all, Prince died. I know…I know…who knew I was a Prince fan? Actually, I can’t claim to have listened to that much Prince in my lifetime, although I know plenty of his songs. However, thinking about Prince yesterday afternoon brought to mind the song When Doves Cry which made me remember the movie Romeo & Juliet from all the way back in 1996! My friend Dee and I were obsessed with both the movie and the soundtrack! I can very distinctly remember spending a Friday night in the room over our garage watching the movie and dancing around to the soundtrack. We may or may not have also climbed onto our air hockey table to dance…which may or may not have led to my Dad getting a little heated with us. Apparently air hockey tables are NOT made for dancing on like you’re at the club…oops! Best game of the week? That would easily be Tuesday night’s 7-0 win over the Miami Marlins! 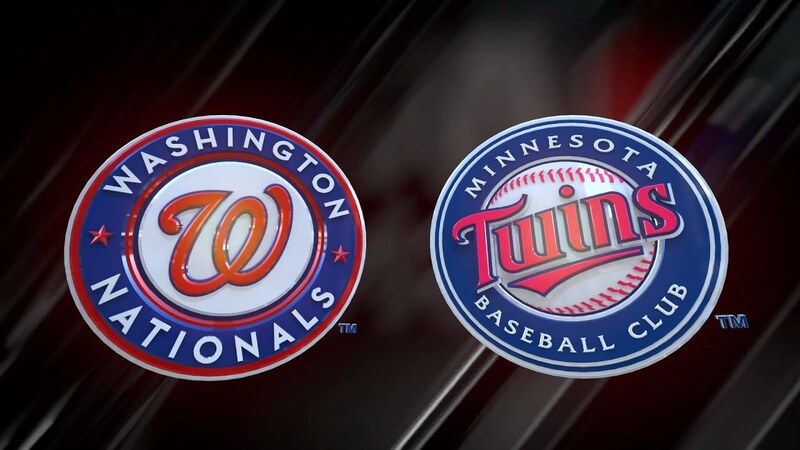 The game was decidedly a pitching duel until the 7th inning when the Nationals bats busted loose and they scored seven runs in the seventh by hitting four home runs…back to back…load the bases…back to back. 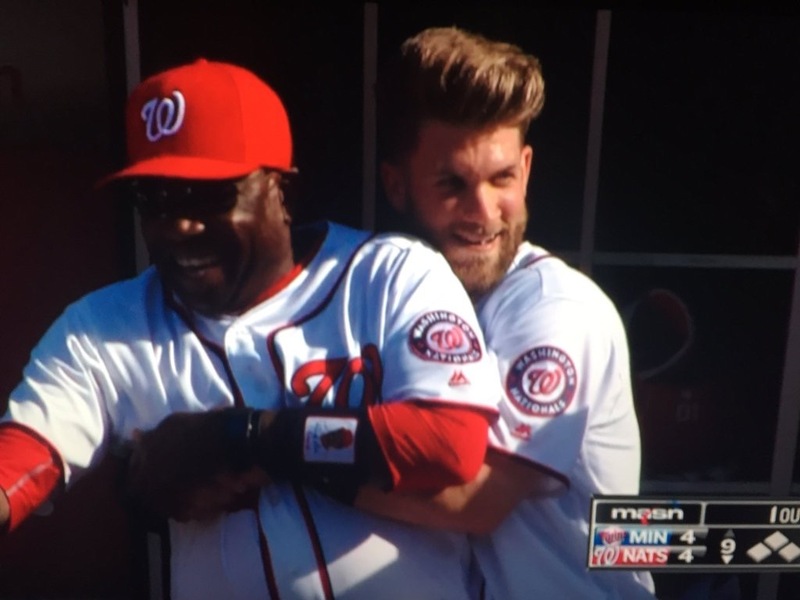 Jayson Werth hit his 200th home run and Wilson Ramos followed with his own homer. The bases loaded up just in time for Harper to hit his 2nd Grand Slam in less than a week and Ryan Zimmerman offered a nice finale by following Harper’s Slam with a home run of his own. A very pretty curly W if you ask me! Three. Game of Thrones Season Six – After what seems like an eternity of waiting for the next season of Game of Thrones, it finally premieres on Sunday night. I am not quite as ravenous about season six as I have been previous seasons…mostly because season five left a lot to be desired (for me). I like the previews I’ve seen and I hope season six is as great as it’s been promised…and don’t even get me started on Jon Snow’s fate! Five. Fitness – This week has gone good! I feel like I’m settling in much better with the whole Weight Watchers thing and I also feel like I’m starting to hit my stride where fitness is concerned! I will say – now that I’ve consistently walked two miles or more almost every day, I feel like anything less than two miles is slacking! Eek! However, I do think that since today is Friday…I may only a mile. Or a mile and a half…. We’ll see! So – there you have it. The five things on my mind the Friday. And now that I’m home from work early, I’m off to get started on my weekend plans a bit sooner than expected. Until next time!